There was once a man who had three sons. 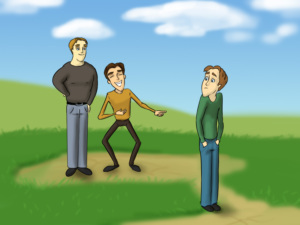 The youngest of the three was mocked and bullied by his elder brothers all the time. They even came up with a horrible nickname for him: Simpleton. 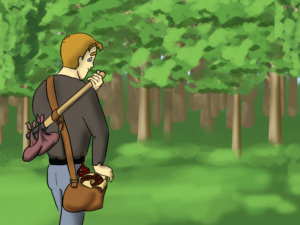 Their father was getting old and wasn’t as strong as he once was, so one day he asked his eldest son to go to the woods to chop wood for the winter. His mother made a cake for him to eat and filled a bottle of wine for him to drink. The boy left for the forest. On his way he met a dwarf who politely asked him for something to eat and drink, but the son said, “I only have one sweet cake and one bottle of wine. If I give them to you, there will be nothing left for me. So goodbye!” Then he left the little man behind. But the dwarf wasn’t ordinary, and he put a spell on the eldest brother. 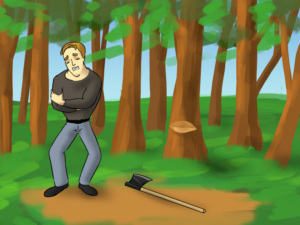 As soon as the son started chopping the first tree, he made a wild swing and hurt his arm. So he had to go home before he had even had a bite from the cake, or a sip from the wine. So the second brother was asked to go instead. His mother gave him a cake and a bottle of wine too. As he was making his way into the woods, the second brother came across the same dwarf. The dwarf asked him for a bite of food and a sip of water if he had any, but the second brother, just like the first one, answered that he wouldn’t share any of the cake and the wine because then there would be less for him. Just like his elder brother, he left the dwarf behind. 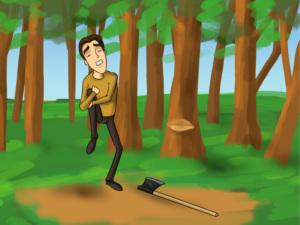 But as soon as he took out his axe and took a few swings, he accidentally hurt his leg and had to go home to have it bandaged. It was again the dwarf’s doing - a punishment for being so selfish. Simpleton was with his father when the second brother returned home without any wood, and asked his father to let him go into the forest. “Absolutely not! Your brothers went and had no luck at all. You will hurt yourself too.” But Simpleton begged for so long that his father had no choice. 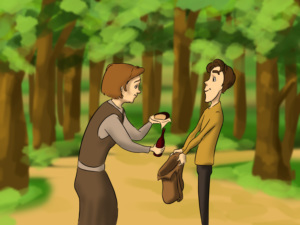 His mother gave him a loaf of old bread and a bottle of sour beer and the youngest brother left. Just like his brothers he met the dwarf on the way into the forest. “Can you give me something to eat and drink? I am starving and I am dying of thirst,” said the dwarf. Simpleton replied, “I only have some old, stale bread, and sour beer to drink, but if that suits you, I would be happy to share it with you.” The dwarf turned the bread into a sweet cake and the beer into wine and they ate and drank happily. 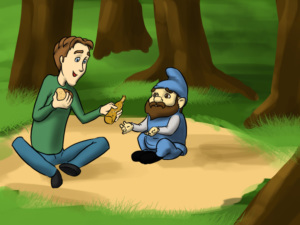 “You shared the little you had with an old stranger, so I will reward you for your kind heart,” said the dwarf. 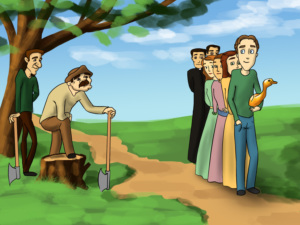 “If you cut down that old tree over there you will find your gift in its roots,” he said and left. 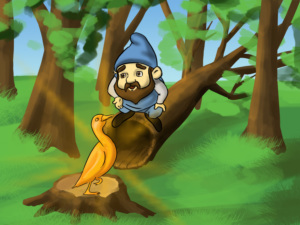 Simpleton cut the tree and there in the roots was a gift he had never imagined - a golden goose. It was covered in gold. It even had gold feathers! He took the goose under his arm and walked to the nearest inn, where he decided to spend the night. He went into the inn and went to sleep, leaving the goose unattended. The innkeeper’s three daughters saw it. They started talking about it: “What an amazing bird!” “Is it really pure gold? 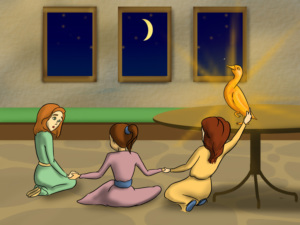 !” and “Wouldn’t it be a amazing to have just one of its gold feathers?” The eldest of the three came closer and tried to pluck a feather, but as soon as she touched the goose, she stuck fast to it. The second one immediately ran to help her sister but she got stuck to the first one. The youngest of the three hadn’t quite thought it through when she ran to help her elder sisters and she stuck to the second one. So they all had to sleep as they were - stuck to the goose. In the morning Simpleton took the goose under his arm and made his way to the town, paying no attention to the fact that there were three girls stuck to the poor bird. On their way they met a vicar. “What are you girls doing chasing this young man here!” he said, indignant at the procession he was seeing. He held the youngest to pull her away, but this only led to him sticking his hand to hers. Now he had to become a part of the chain too. They came across a second vicar who, amazed at the quintet, decided to remind the first one that they had a christening that day. 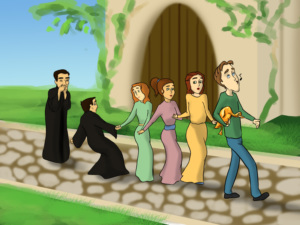 But before they could warn him not to touch anyone, the second vicar was already stuck tight to them and so he had to join the strange parade. Trotting one after another, they came across two woodcutters, who held their axes and offered to set them free. But as their axes touched the group, they were immediately held fast to the others, forming a train of seven. 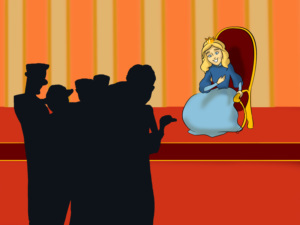 As Simpleton and the people behind him entered the city they heard that the King would give the Princess’s hand in marriage to someone who could make his daughter laugh, because she was so serious all the time. Simpleton decided that they looked funny enough, so he went to the King’s daughter. When she saw the funny convoy of people and a gold goose, she laughed so hard that her stomach hurt. 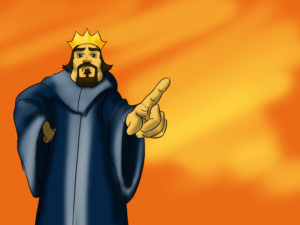 Although Simpleton was the only one who had managed to complete the task, the King didn’t want his daughter to marry him, because he said, “He is too simple for my princess.” So the King thought of another quest. “The man who finds me someone able to drink a cellar full of wine, will take my daughter to be his wife!” he said. 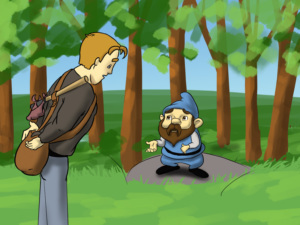 Simpleton thought the dwarf could help him and so he ran to the woods to find him. But instead of the little old man, he met someone who was crying. Simpleton asked him what the matter was. “I cannot quench my thirst no matter how much I drink,” the man explained. 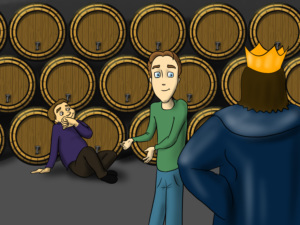 He told the man to stop crying because he had just the right thing for him and he led him to the King’s cellar where the man drank and drank, and drank and drank until he drank the last drop of wine. Again Simpleton was the only one to solve the quest. But again the King wasn’t happy. 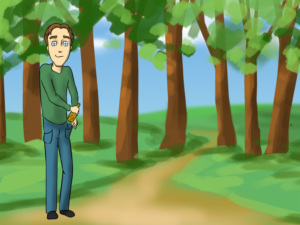 He decided to make a third quest, hoping that even Simpleton couldn’t accomplish it. 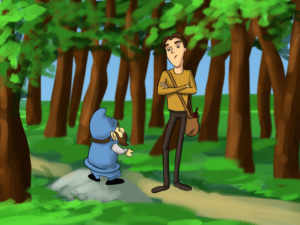 “When you find me a ship which can sail on land and on water, you will have my daughter’s hand in marriage.” Simpleton went into the forest for the last time and found the dwarf waiting for him. Before Simpleton had said anything, the dwarf spoke. 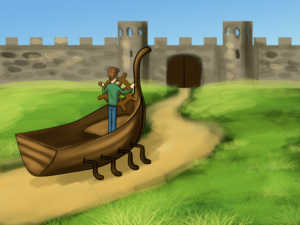 “I have just what you’re looking for, and since you have such a good heart, I will give you my boat, which can sail on both land and water.” When the King saw Simpleton sailing back in the ship, he had no choice but to give his daughter to the boy. 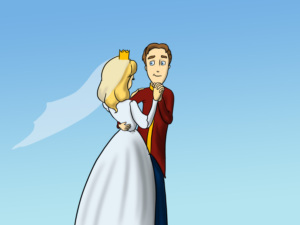 This is how Simpleton won the princess’ heart. They lived happily together. After the King’s death, Simpleton and his wife ruled the country together. His parents and his brothers never called him Simpleton again but always used his real name.